Eastern white pine tree trunks; photo by Nicholas A. Tonelli (Nicholas_T) on Flickr (use permitted with attribution). Maine's nickname is "The Pine Tree State;" the white pine appears on the state flag, seal, and Maine quarter; and Maine even honors the white pine's cone and tassle as the official state floral emblem. 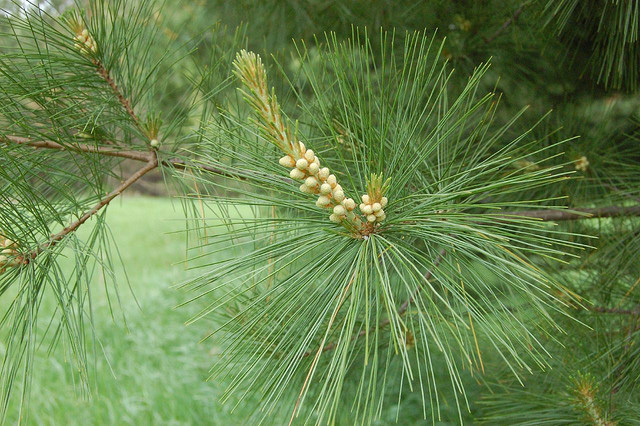 Eastern white pine (Pinus strobus) is a large pine tree native to eastern North America (occurring from Newfoundland west to Minnesota and southeastern Manitoba, and south along the Appalachian Mountains to the extreme north of Georgia). 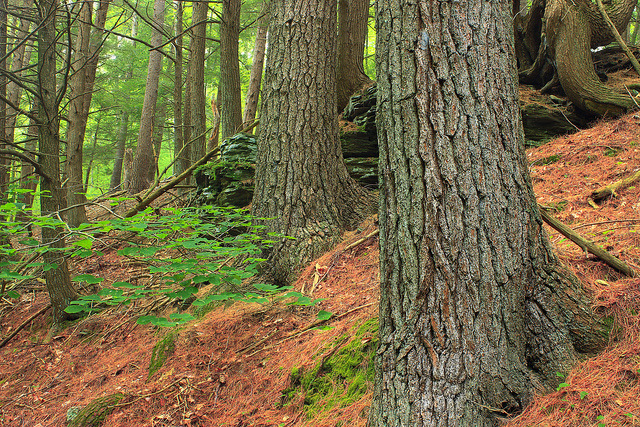 White pine forests originally covered much of northeastern North America, but only about one percent of the original trees remain untouched by extensive logging operations in the 1700's and 1800's. In natural pre-colonial stands it is reported to have grown to as tall as 230 feet (70 meters) tall. Currently the tallest pines reach to between 160-180 feet (50 and 55 meters ). Old growth pine in the New World was a highly desired wood since huge, knot-free boards were the rule rather than the exception. 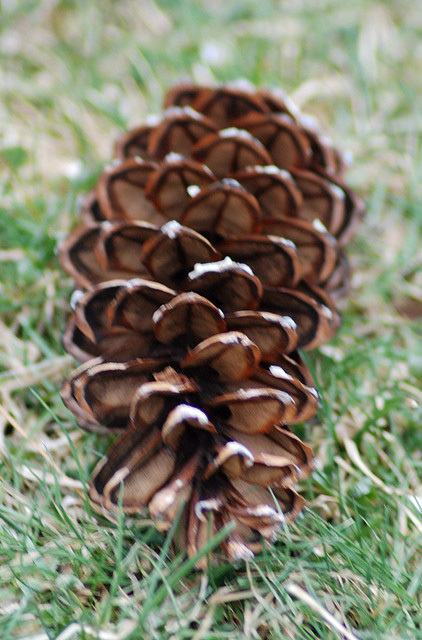 Pine was common and easy to cut, so many colonial homes used it for paneling, floors and furniture. During the age of sailing ships, the tall pine trees with their high quality wood were valued for masts. Pine was also a favorite tree of loggers since pine logs can be processed in a lumber mill a year or more after being cut down. Most hardwood trees (like cherry, maple, oak, and ash) must be cut into one-inch thick boards immediately after felling or large cracks will develop in the trunk which can render the wood worthless.